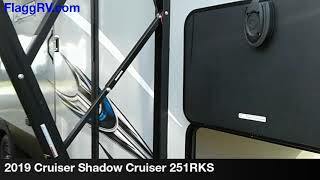 Hi, I am interested in your 2019 Cruiser Shadow Cruiser (stock #86798) listed on Autotrader for $25,995. I'd like to get more information about this vehicle and confirm its availability. When you take your next adventure in this Shadow Cruiser travel trailer, you will be traveling in a unit that provides comfortable yet updated amenities, like the LED interior lighting and the 6 9 vaulted ceilings. The single slide that has been included in this unit provides extra space for this trailer to sleep five people each evening, and the two entry/exit doors allow the front, private bedroom to have its own outdoor access.